What if you could prepare a fabulous stir fry recipe in minutes that tastes better than takeout? Not only will it be cheaper than eating out, you can eliminate the MSG and other ingredients that cause discomfort to many of us. Our stir fry recipe version is a family favorite at our house because it’s so versatile and fast to throw together. 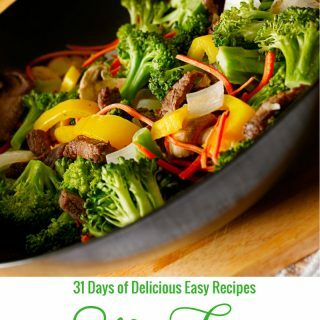 It’s Day #4 of 31 Days of Delicious Easy Recipes for Busy Wives, y’all! 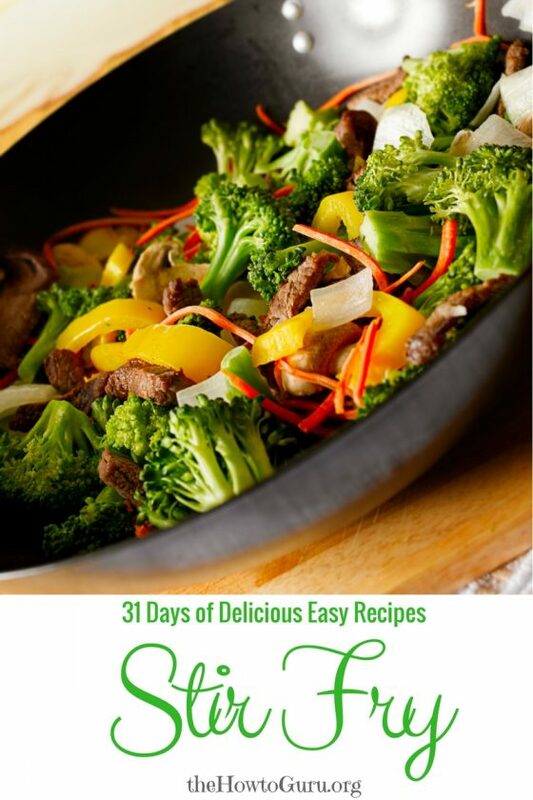 Since many of you lovely ladies have told me that cooking is your greatest struggle (even referred to as a thorn in the side), let’s lose the stress and have 31 days of fresh meal ideas. The stir fry recipe I’m going to share is the simple plan I follow, but it is one of the most customizable recipes ever. You can choose the best vegetables to use, which starchy food (rice, quinoa, pasta) to pile it on, and what flavors you want to add into it. I begin by cooking the rice or pasta in a saucepan and then getting a little butter, coconut oil, or olive oil melting in a skillet on medium/low while I chop the fresh veggies (or open the bag of frozen ones) and pre-cooked meat (like yesterday’s crockpot chicken). Secondly, I season with salt and pepper and add our favorite soy sauce alternative without the insane amounts of sodium, Liquid Aminos or Coconut Aminos Sauce . Stir meat and vegetables until well-blended and saute’ about five minutes or to the level of crunchiness that you prefer. What do we like in our stir fry recipe? 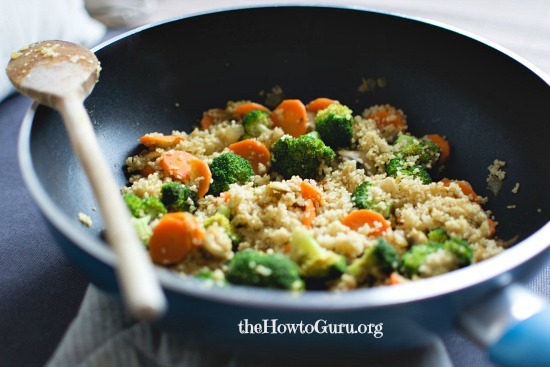 Always garlic, onions, carrots and broccoli. Sometimes jalapeno, sometimes not. Other veggies may be added like bell peppers, depending on what we have on hand. Always served over rice, quinoa, or pasta. Most of the time we only use the aminos listed above but for a treat, we add an Asian pink sauce. Now wasn’t that easy? What will You add to your stir fry recipe? Be sure to SUBSCRIBE HERE to keep up with all of the hope and hacks for busy wives. Family travel, beauty, and wifelife tips and encouragement will visit your inbox now and then. You can also follow along daily on the Guru Facebook page, Twitter, and Instagram. Take back an Old Fashioned Christmas! Pingback: Homemakers: How To Get Mayberry Back And Quickly! Pingback: Easiest Homemade Meatballs Ready In 20 Minutes Flat!